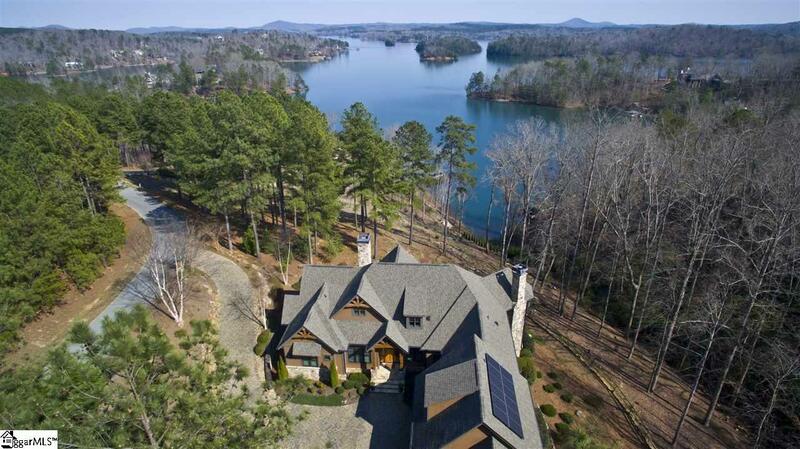 Nestled on a waterfront hillside above Lake Keowee, and with a view that stretches for miles across open water to distant mountains beyond, 411 Evergreen Trail is a decidedly exceptional experience in lake living. 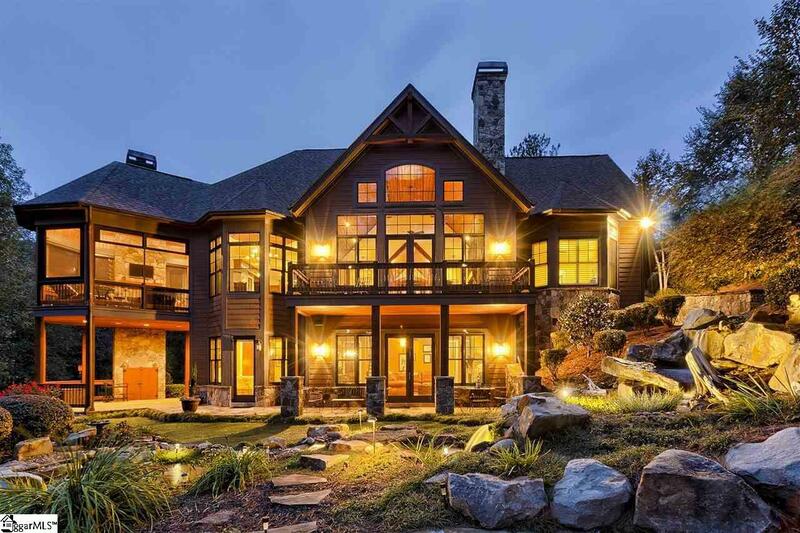 The setting is extraordinary: An enchanting natural stream flows across the property in a blend of waterfalls and gentle effervescence, and is crowned by an Appalachian-style covered bridge. Its companion is a recirculating water feature at the rear of the home that flows down multiple falls and under a natural stone bridge to a sizeable Koi pond, all the while delivering serene sounds throughout the homes outdoor spaces and echoing indoors when windows are open. Park-like landscaping transforms the walk to the lake and covered dock (with lift and jet ski pods) into a captivating stroll. Extensive exterior lighting illuminates meandering stone walkways, wood stairs, a fire pit with seating area, boulder retaining walls, multiple benches, and mulched cart/ATV paths leading to a waterside parking deck. Lovingly cultivated flora comprises ornamental evergreens, whispering pines, grand hardwoods, berry bushes, and near-year-round blooms from a potpourri of perennials. The house, resting at the end of a paver drive and motor court, presents a handsome stone and masonry siding exterior. 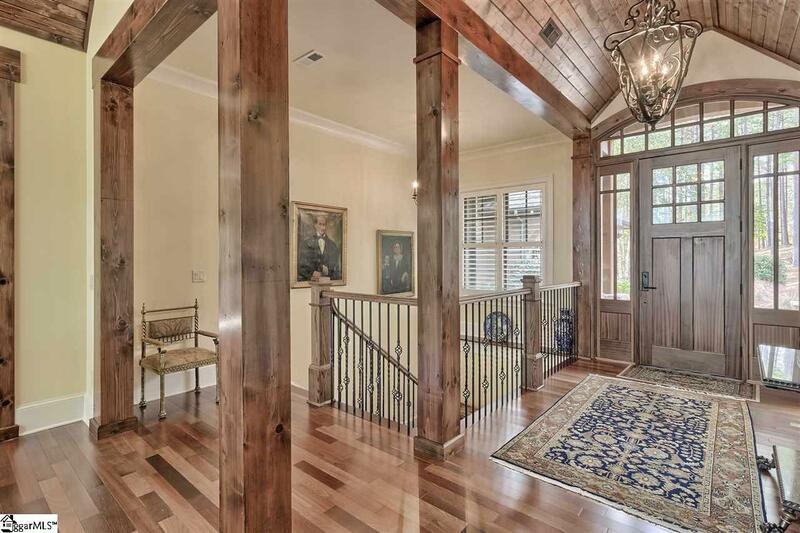 A mahogany entry door opens to the great room and far-reaching views, heightened by three levels of windows. Brazilian cherry floors and wood-planked ceilings outline the space. Cherry cabinetry flanks the stone fireplace, with one side housing a TV lift concealing a large flat screen. French doors open to the rear Ipe deck, where a daily kaleidoscope of vibrant sunrise colors rewards the early riser. Adjacent to the great room, the copious kitchen is lined with stately custom cherry cabinetry by Savage Company. Details of note include upper cabinets with glass fronts and accent lighting, granite counters of wonderfully warm tones, tile backsplash, immense island, heavy wrought iron chandelier, double ovens, gas cooktop, and walk-in pantry. The dining room sits in an oversized, waterfront, bay-window area and is topped by an octagonal wood ceiling. French doors in the kitchen/dining areas access the homes piece de resistance, an outdoor screened porch with stone fireplace, built-in grill, wood ceiling, and ingenious, retractable vinyl "windows that afford truly year-round comfort and convenience. The porch provides the ideal vantage point for taking in the stunning scenery: the natural stream on one side, the water feature with Koi pond on another, and the lake and mountain vistas on yet another. On the opposite end of the main level is the master suite, arrayed with a tray ceiling and bay window in the bedroom, double custom closets, and, in the bath, his and her vanities, tiled shower with multiple heads and bench, and spa tub overhung with a fanciful chandelier. The main level concludes with a den or study located just off the foyer; this inviting room has its own half bath (another half bath borders the kitchen). Stairs near the garage entry lead to an upper-level bonus suite with full bath, lengthy built-in desk and shelving, walk-in closet, and attic storage. The lower level furnishes boutique accommodations. The family room incorporates the homes third stone fireplace, as well as a bar kitchenette. A multi-purpose room has floor-to-ceiling cabinets and wood shelving; presently used as a gym, it offers numerous possibilities. Two generous bedroom suites both open to the rear terrace and adjoining gazebo patio, pre-wired for a hot tub. Tucked at the back corner of the house, an outdoor shower with stone surround is a rustically chic spot for rinsing after lake fun. Additional features of the home speak to its quality and comfort: a solar system for emergency electricity, comprehensive audio, video, and security system by Fusion, two-and-a-half car garage with polymer flooring, and extensive irrigation system.